The first is procedurally generated terrain which is more reminiscent of the original game’s terrain. A new terrain is generated at each level start so that no two levels are quite the same. 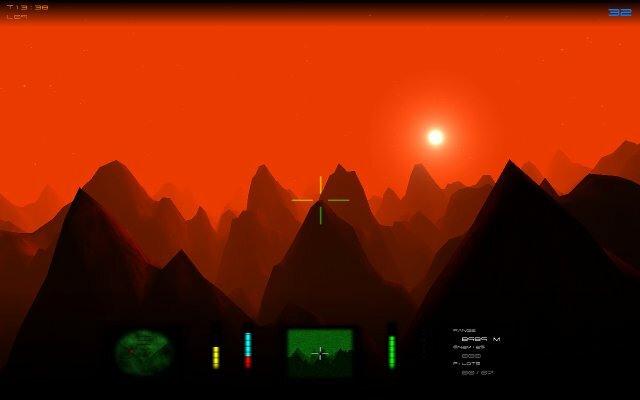 The terrain is generated using the Diamond-Square algorithm which I chose as it was created by Loren Carpenter who also made the terrain for the original Rescue on Fractalus, so I figured it was very likely to be the same algorithm used in the original game. Pilot model! Click on the image to zoom in to see it – to the left of the crosshairs. The second is the pilot finally has a model! I’ve been experimenting with making the pilot model in Blender for a while and it’s about time for it to be included. The above images are not final and these features are likely to change a bit before the release of 0.9 as I continue to develop them and other features. I hope to have 0.9 ready some time in the next few months. Follow me on Twitter or my Facebook page for updates! Fractalus 0.8.0 alpha build is now available for download from the Fractalus project page, and is now available for Windows, MacOS, and Linux! Fractalus 0.8 has been entirely rewritten using Unity Engine so that I can focus more on the game itself instead of spending most of my time working on my own custom engine. There isn’t much new in the way of features or gameplay in 0.8 over the previous build as most of the time was spent on porting everything across to Unity. As I can now focus more on the gameplay and art rather than the engine code, I will hopefully be able to release new builds more frequently than every few years. Rewrote Fractalus using Unity engine. Real-time shadows and lighting and various other graphics enhancements from Unity engine. Improved auto-pilot control during landing/launch sequence. Menus can now be navigated with mouse. If you have any thoughts, comments or feedback, leave a reply below or let me know on Twitter or Facebook! Once again it’s been a while since the last release of Fractalus. As before, I’ve been very busy and not had a lot of time to work on it, and for the time I did have to work on it I didn’t make much progress. Most of this comes down to Fractalus being built on my own custom engine which meant that in the little time I had, I was working on both the game and the engine, and it turns out developing a game engine is quite time consuming (I know! Who’d’ve thought?). In a previous post I mentioned thinking about moving to another game/graphics engine but wasn’t sure if I should. I ended up deciding that it would be the best thing to do for the project, and would allow me to focus more on the game itself, and so I began work on rebuilding Fractalus from scratch using the Unity engine. So far it has been a long process to rebuild everything in Unity, but at this point I have an accurate reimplementation of the in-world graphics and a portion of the gameplay as it was at 0.7. There is still more to be done to bring it fully up to what 0.7 had, and there are some new things that need to be added for 0.8 as well. I hope to have Fractalus completely ported to Unity within the next few months, with 0.8’s release to follow soon after. Follow me on Twitter or my Facebook page for updates! Fractalus 0.7.0 alpha build is now available for download from the Fractalus project page. Added cockpit, cockpit instrument panel models and textures. Added cockpit mesh, rotates slightly depending on ship turn motions. Added wing clearance cockpit panel. Added HUD mode option, can be set to 0.5, 0.6 or 0.7. Added option to toggle cockpit model in 0.7 mode. Added option to toggle cockpit motion in 0.7 mode. Added named indicators to cockpit HUD on left side. Cockpit instruments turn red momentarily when ship is damaged. Added ship impact sound when colliding with terrain. Added ship damaged by laser sound. Engine sound now changes in pitch based on velocity. Saucer alert noise is no longer a constant droning noise. Saucers now have a deep humming engine noise when they get close. Defaulted graphics settings to HD terrain and Dust enabled. 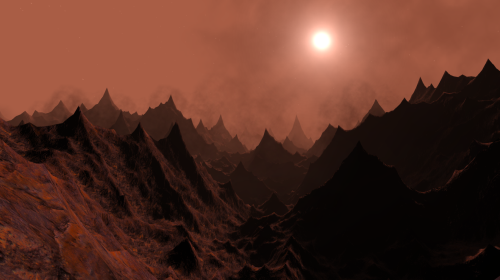 Fixed texture repeat frequency on high-detail terrain. Starfield on title screen now slowly rotates. Stars now rotate along with sun. Highlighted menu entry now has subtle pulse. Fixed saucers occasionally appearing black. Implemented joystick controls for all game functions. Implemented joystick support for menus. Added joystick control mapping options. Severely reduced terrain collision damage. Saucers now do 300 damage upon collision instead of 2500. Saucer collision now results in a much smaller alteration of player flight vector. Saucers will now ignore player if systems are off (regardless of whether player is landed). Saucers now move 37.5% slower, allowing the player to outrun them. Saucers now spawn slightly less frequently. Saucer behaviour slightly improved, will not follow you into deep trenches. Increased turret target lock and firing range. Updated Fractalus to compile under GCC 4.8.2. Fractalus now uses SDL 2.0 instead of SDL 1.2. If you have any thoughts, comments or feedback, head over to the forum and post them! It’s been a while – a long while – since Fractalus’ last release, v0.6 back in 2012. Quite a few of you have contacted me asking about the next release, so I figured I should write up a blog post to tell everyone what’s been happening. So, progress is still being made on Fractalus, and v0.7 is still in development. I have not abandoned the project, I’ve merely been preoccupied with other things – work and life have a habit of getting in the way. 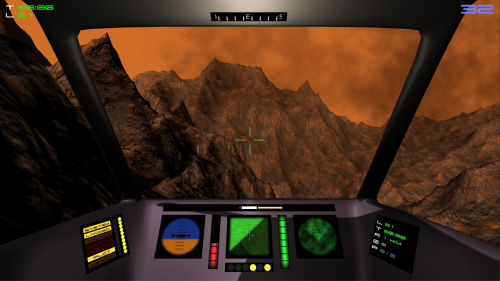 I have also been considering what to do with Fractalus’ implementation, in particular with the graphics and rendering the models for pilots and the cockpit. As Fractalus is built on my own custom graphics engine, I am writing everything from scratch including the model rendering logic. 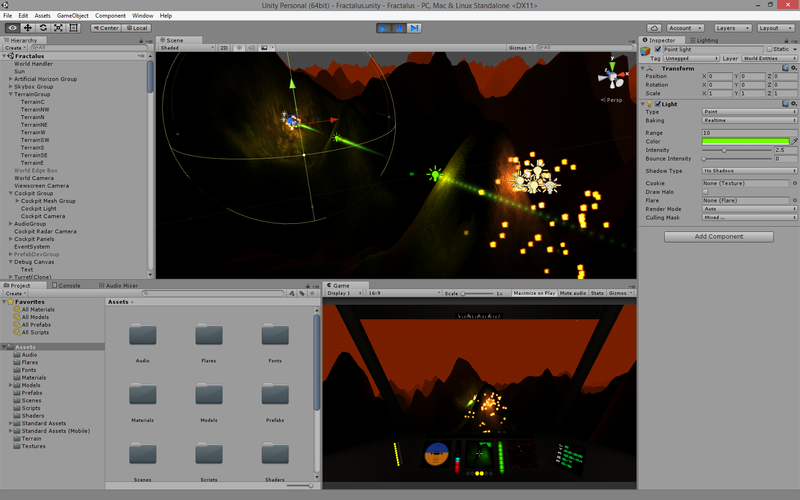 As my time is quite stretched, I’ve been considering abandoning my own engine and rebuilding Fractalus using Unity3D or another engine, which would potentially allow me to work on the game more often and release new versions more frequently, as I could focus more on the game itself rather than spending as much time working on the game as I am working on the underlying engine code to support it. Anyone else think this is a good plan? Saucers now ignore player if ship systems are off. Saucers no longer occasionally appear completely unlit. Saucers do less damage upon collision and affect your direction less severely. Saucers now move slower, allowing the player to outrun them. Ship engine sound now pitches up and down as well as fading to reflect speed (Still some work to be done on the sound). Fixed texture repeat pattern in high detail terrain mode. Stars now rotate with the sun. Title screen starfield now rotates. Joystick support (control customisation still being worked on). Selected menu entry now pulses slightly. Engine now uses SDL 2.0 and is built with GCC 4.8.2 (under Windows). This is an early prototype modelled on the cockpit design from the original game. I’m still working on this design, so it is likely to change (and quite likely to become a bit more detailed) before it makes an appearance in a new version. Hopefully it won’t be too long before I have 0.7 released. Any questions or comments? Comment below or visit the forums. Follow me on Twitter or my Facebook page to keep informed as I work towards releasing 0.7. Fractalus 0.6.0 alpha build is now available for download from the Fractalus project page. Fractalus 0.5 was released just over a year ago. In that year, it has been downloaded over 1000 times. A few of you have contacted me directly asking about progress on the next version. Over the last year, I’ve been busy working on another project (Fastvue Dashboard, a real-time internet usage monitoring solution), and haven’t had time to do any work on Fractalus 0.6. However I am now able to spend a bit of time on it and will hopefully have 0.6 out in a month or so. Follow me on Twitter or my Facebook page for more updates as I start work on 0.6. Fractalus 0.5.0 alpha build is now available for download from the Fractalus project page. There is still a lot of work to be done, but I think this build is fairly playable. Let me know what you think at the Fractalus forum. I’ve been working on this project for a while, and I now feel that it’s nearly ready to be publicly released, so I’m announcing it first before I put together the release. 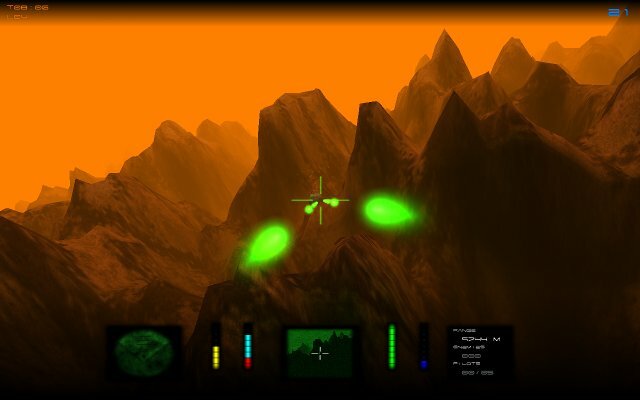 Fractalus is a remake of the classic game “Rescue on Fractalus”, developed by Lucasfilm Games (now LucasArts) in 1984 and released on Atari, Commodore 64 and other platforms. My intent is to keep the remake as faithful to the original as possible, so although I’ve had some ideas of my own on extending the game play beyond what the original provided, I’ve not implemented them. In the future I’ll probably implement these ideas as alternative game modes, while keeping a classic mode option available. I began this project after spending a lot of time looking at other retro remake games and having fun playing them. I remembered playing Rescue on Fractalus when I was young, and wondered if anyone had made a remake of it. After extensive searching, I couldn’t find anyone that had even attempted a remake, so I decided to do it myself. Read more on the project page. I’ll release an alpha build soon, just a few more modifications need to be done before I’ll consider it ready.